The mixed up alphabet antics continue in this second Alpha Oops book. A isn’t ready to go on, but H has to start a Halloween book anyway. 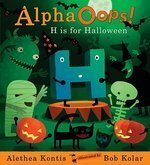 H starts with Halloween, and the other letters join in for a Halloween-themed alphabet that is not in any particular order. As the letters reveal themselves, poor B keeps on trying to get his word in but is upstaged each time. He tries to be a buccaneer, but P is wearing the same costume for pirate. X has trouble finding the perfect word too, but S is there with a great idea. Keep an eye on the bottom of the page as the alphabet fills in with pumpkins bearing the letters that are in alphabetical order. You will just have to wait until the end of the book to find out what B has in store for you! This entry was written by Princess Alethea and posted on October 22, 2010 at 7:36 am and filed under Books. Bookmark the permalink. Follow any comments here with the RSS feed for this post.